Bob Clampett’s reputation for directing the zaniest cartoons during the golden age of animation is legendary. Beginning as an artist on the earliest Merrie Melodies cartoons, Clampett moved through the ranks to become a top animator in 1934 and a director in 1937. Instrumental in the development of Bugs Bunny, Daffy Duck and Porky Pig, Clampett created many mainstay characters such as Tweety, Beaky Buzzard, Gremlins, and the Do-Do. In his teens, Clampett designed the first Mickey Mouse doll for Walt Disney. Shortly thereafter, Clampett went to work at the Harman-Ising studio and animated scenes for the first Merrie Melodie made, “Lady Play Your Mandolin.” In 1935, when the studio was still looking for a star, Producer Leon Schlesinger suggested a cartoon version of Our Gang. Taking the reins of this idea, Clampett designed a fat little pig named Porky and a black cat named Beans for Friz Freleng’s cartoon “I Haven’t Got a Hat”. 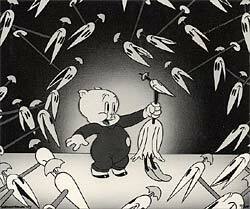 Although Beans got top billing, Porky was a hit, and subsequently became Warner Bros. first cartoon star. Clampett left Warner Bros. in 1946 to open his own studio. He created a live daily puppet show, featuring a sea serpent named Cecil, and the serpent’s propeller-and-hat-toped best pal, Beany. “Time for Beany” earned Clampett three Emmy awards for best Children’s program. In 1961, Beany and Cecil debuted on ABC with their own animated show, which ran five years straight on the network.